The main agricultural festival of Nocte Community, Chalo Loku was celebrated with traditional fervor and gaiety at Deomali today. While attending the Chalo Loku Festival as Chief Guest at Deomali, Deputy Chief Minister, Chowna Mein lauded the Nocte Community for keeping alive their rich culture & traditions. While calling upon the people to preserve their rich culture & traditions, Mein said that the efforts must be done to keep alive the rituals, which is the gist of our cultures. He said that Arunachal is a land of festival and we must showcase our rich cultural heritage to the outside world to promote cultural tourism. Citing that the State has huge potential of Tourism Industry, if properly manage and organize, we can attract tourists round the year in the State. He said that the Pema Khandu led Govt is a federal Govt and respect all faiths and communities equally. He added that our Govt is also emphasizing on the equitable development of all the regions of the State giving equal importance for the development of both the Eastern and Western Parliamentary Constituency. He asserted that the Govt will leave no stone unturned to bring in all round development in all the sectors of the State including education, health, road communication, power, hydropower, Information Technology, tourism, etc. He said that the Double Laning of Deomali to Khonsa road will be looked into and pursue the MoRTH for early start of the project. He further informed that another Rs 2000 Crore worth rural road projects will be implemented in the State under PMGSY in the coming year making the total cost of projects under PMGSY to Rs 4000 Cr in the State. Responding to the three points memorandum submitted by the public on the occasion, Mein said to look into all their demands in the coming financial year under RIDF. Tapir Gao, state BJP President called upon the people to celebrate the one’s own festival with true spirit and enthusiasm. Praising the people for participating in huge numbers, he said that religion and culture are two different facets, which should not be mixed. He urged the young generations to actively participate, to learn from their elders and take up the responsibility of preserving the rich cultural heritage of the State. 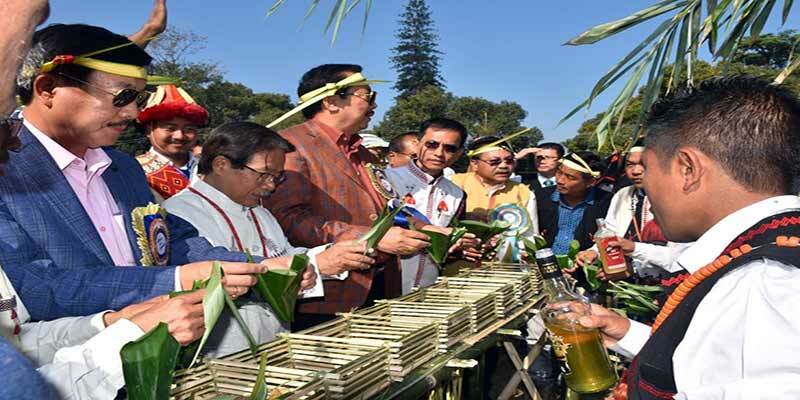 Minister PHE & WS, etc., Wangki Lowang, who is also the local MLA said that Chalo Loku is one of the agriculture related festival of the Nocte Community which is celebrated for recreation and merry making after seasons of hard work. It is the time to forget and set asides differences and sit together for feasting, he added. Citing numbers of festival by the Community, he opined to celebrate all these festivals in a week by organizing a Festival Week every year. However, it will need consensus of all the people before doing so. On the occasion, DCM released a Nocte Modern Audio Album ‘Kangthe Kowa’ produced by Er Gangtong Bangyang & Dr Vineetha Dowerah and a book titled ‘Ethos of Heart’ written by Thajam Aboh. Earlier, Mein participated in the Log Drum ‘Thum’ beating and a festival ritual at Rangsom Hum. Other attractions of the festival were Nocte Modern Mega Dance, Bamboo Dance and Nocte Modern Dance. Among others, Wangpha Lowang, Former Lok Sabha MP from East Parliamentary Constituency and Wanglong Rajkumar, Public Leader were also present on the occasion.